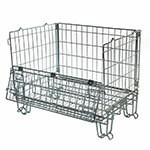 These metal cage pallets are an effective method of storing equipment that needs to be easily moved. The Zinc Folding Wire Mesh Pallets and the Heavy Duty Mesh Folding Cage Pallets have wheels so they can be pushed along and they can all be moved in the same way a pallet is moved with either hand trucks or a forklift. Being stackable they are also compact to store too. 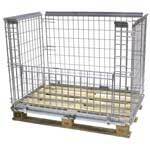 The drop front provides easy access to the contents of the pallet cage and the wire mesh allows contents to be visible. 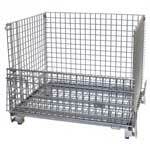 When choosing which of these steel cages to purchase, the main consideration will be how much weight you need the cage to hold. For high capacity requirements, choose our 1000kg capacity collapsible Hypacage Mesh Pallets. Pallet cages are available with castor wheels should a mobile unit be required. There is also a choice of sizes available, these include standard euro pallet sizes. Our stackable pallet cages are used in conjunction with a standard wooden or plastic pallet to create a retention unit and they can be stacked up to 4 high providing large storage areas.